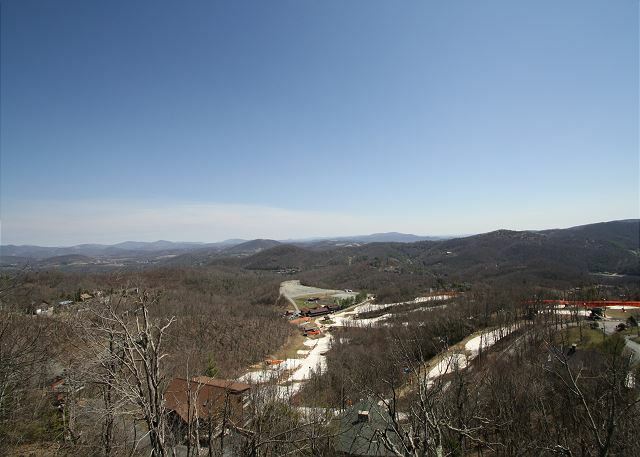 Experience breathtaking mountain vistas, fall colors, Fourth of July fireworks, or watch skiers try out the slopes of Appalachian Ski Mountain from this spacious 4 bedroom 3.5 bath home. 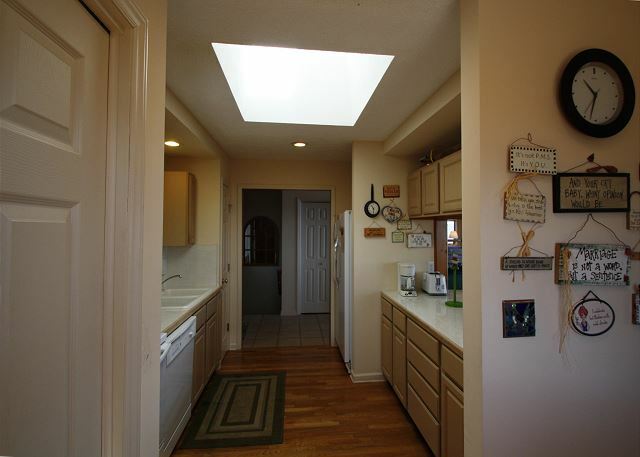 Spread out over two separate living levels there is plenty of room for the whole family. 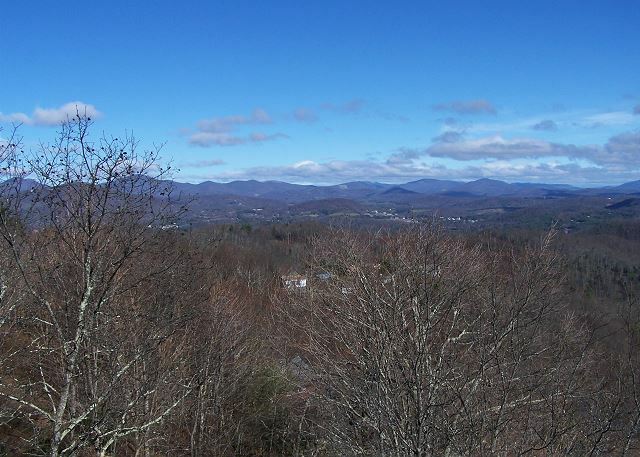 Located on Alpine Drive, Mountain Breeze is only minutes from Blowing Rock and Boone. Cathedral ceiling in the great room with a stone wood burning fireplace (firewood is not provided), comfortable leather sectional, flat screen TV, wireless internet, AC. Well equipped kitchen with seating for two in the breakfast nook, and four at the breakfast bar, dining area has seating for 6. Master bedroom on the main level has a king size bed, flat screen TV, VCR, DVD, private bath with a whirlpool tub. Downstairs open den for the kids with plenty of room, flat screen TV, VCR/DVD. Guest bedroom with a queen bed, TV. Guest bedroom with two twins. Additional guest bedroom with a queen,private bath, hall bath. Easy access, paved parking for 2 cars. Four-wheel drive required in winter weather. Property maps may not be accurate on 3rd party web sites. Please contact the office directly for exact property locations. We loved it! However, the bed in the master bedroom was much too high for our healthy 90 yr. old. Also there need to be grab bars in the master bathroom. Overall we love this house. This is a most spacious home for 8 people to stay in. The view of the mountains was spectacular. Will most definitely stay here again. The design and furnishings of this home make it work well for large groups. It worked well for our family that included 3 couples, 2 teenagers, and a baby. The views, when they could be seen, showed off the mountains and skiing activities well. 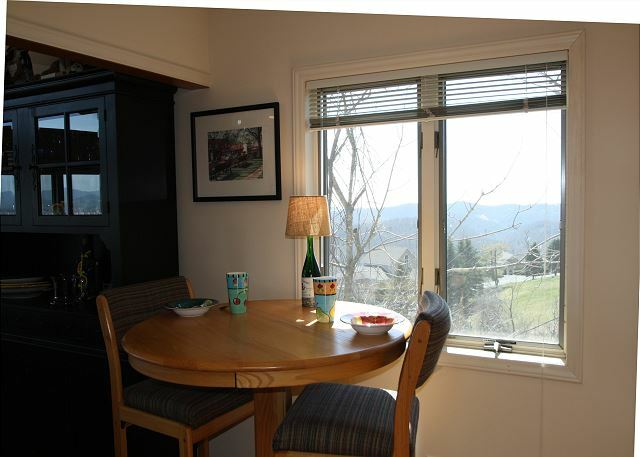 This was our 5th or 6th stay at Mountain Breeze on Appalachian Ski Mountain. It has become a second home. We have probably stayed in more than 20 homes on the mountain, but we have now settled into Mountain Breeze. 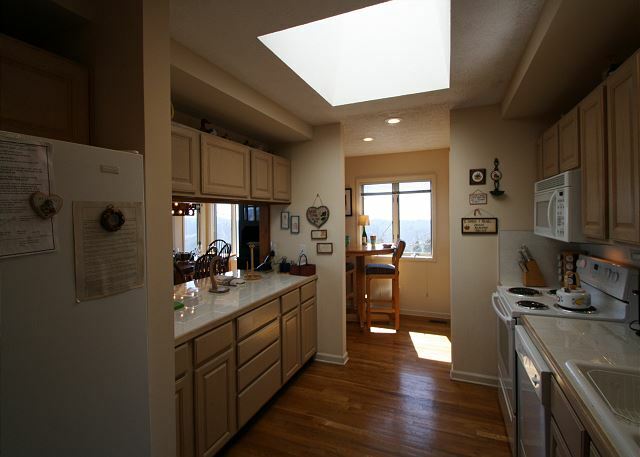 It is a beautiful home, comfortable, well maintained with lots of space and OUTSTANDING views. The fall colors were amazing this year and we were able to enjoy pre, peak and post during our month there. It is a wonderful respite from the craziness and stress of the city. We look forward to our visits and hopefully will be back again soon. Everything was great. This was a lovely home with great views, just as described. We stayed here with our 4 children and had more than enough space. Everyone enjoyed the jacuzzi tub and sitting on the porch day and night looking at the mountains. 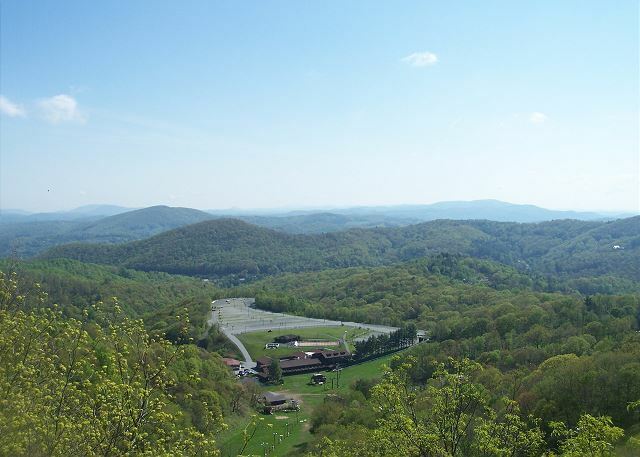 It is close to everything we wanted to see and do - Tweetsie, Grandfather Mountain, Moses Cone historic house, Boone and Blowing Rock. 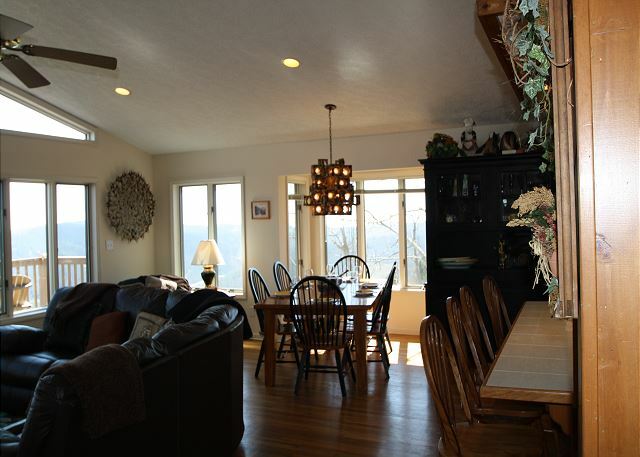 Mountain Breeze was perfect get-together house for my three siblings + spouses. The kitchen and common spaces were perfect for our needs. All of us would recommend this property enthusiastically. the kitchen and common spaces were perfect. One of the things we were looking for was a great view for our 3 couples and one child. We had the view! We would say that if it was snowy and icy, the road would be tough. 4-wheel drive a must in bad conditions. 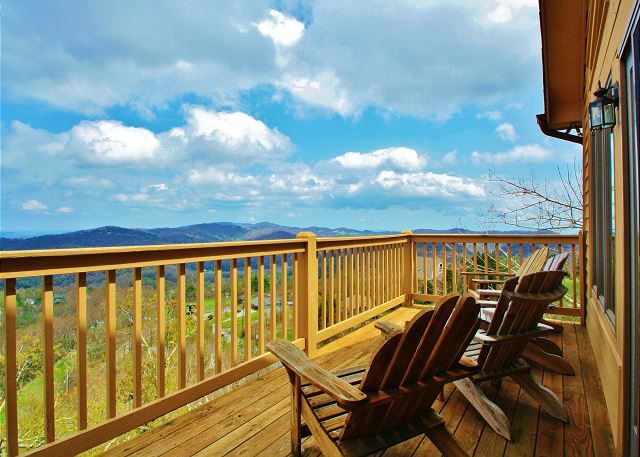 The house sits just above App Ski Resort and you can see the slopes from the deck. The house was very well equipped and we were pleasantly surprised. Keurig and regular coffee makers, tea kettles, cookie sheets, lot of bowls and serving platters. WE had friends over on the last night, so we comfortably sat 9 at the table. The kitchen appliances are a little old, but everything else is great. I heard from the two couples in our group, that were downstairs, that the beds down there were comfortable, but the quilts/covers on them were pretty old and needed updating. The children's comforters on the twins were great. There was some dampness downstairs, but it was not really a problem. Lots of TVs, great wifi and a great wood burning fireplace. We had a very good time. We were there from Christmas 2015 to New Years and we had no snow. We enjoyed area attractions when it was not raining. Grandfather Mountain and Linville Falls were within an hour drive. We ate in most days but did venture down to the village of Blowing Rock to play in the park and eat a local restaurant for lunch. Grocery stores and everything else we needed were within 20 minute drive. Excellent location and view. Home is well designed for ultimate privacy. Kitchen needs updating and organizing. One of the downsstairs bathroom floors stayed wet. Jenkins realty is great to work with and responded immediately to our concern. Excellent realty company to work with. Thanks for taking the time to leave your comments. We're glad you enjoyed your visit. We'll pass your review on to the owner. The plumbers said the moisture on the floor was condensation. Thanks for bringing it to our attention. This was our 5th stay in Mountain Breeze - a beautiful house in an outstanding location with magnificent long range views. Our three week stay was wonderful despite some problems. There had been heavy rains the weekend before we arrived and the windows and doors in the lower level had leaked leaving the carpets on the lower level wet. It occurred again at the end of our stay and even the doors upstairs were leaking from heavy rains and strong winds. The house is beginning to show some aging, needs paint outside and some minor repairs - but it is still a delightful and comfortable home away from home and we will be back. Thanks for leaving your comments. I'm happy to say the water leak has been repaired. Thanks for the pouring rain for pointing it out. We look forward to your next visit! We have stayed in this property several times and always find it to be a delight. The location is ideal and the house itself has become a second home. It is comfortable and well furnished in all details. We keep coming back and seem to enjoy our time there more each visit. 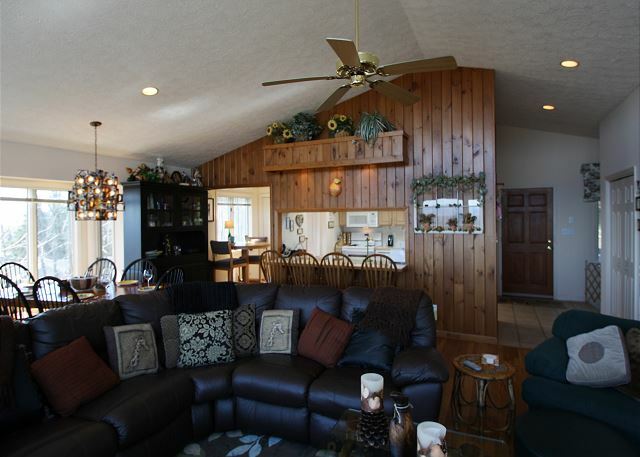 Ideal cabin for relaxing and for hosting friends and family.